Apple Amino Acids and our antioxidant-rich APS formulation, Vitamin B5, Sea Minerals plus energising essential oils including Lime, Peppermint and Spearmint. Suitable for all skin types, especially sensitive and delicate skin. 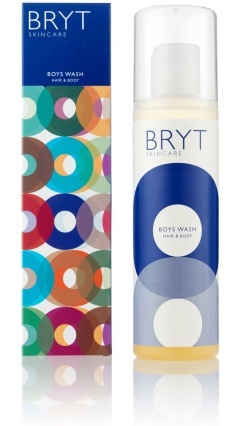 BRYT Wash for Him contains our antioxidant-rich APS formulation to soothe, calm and nurture skin. Environmentally friendly, skin compatible Apple Amino Acids create ultra-soft bubbles which gently cleanse and exfoliate. Sea Minerals ‘reboot’ the skin, increasing vitality and improving tone. Guar Gum, a natural polysaccharide (extracted from the seeds of the Guar Bean) conditions both hair and skin, leaving them hydrated and healthy. Vitamin B5 further improves the appearance of hair and nails. An invigorating blend of citrus essential oils including Mandarin, Lime and Orange, blend with energising Peppermint and Spearmint. To be used whenever you take a shower. Place a small amount into the palm of your hand and massage vigorously into the hair especially around the ears, nape of neck, the hairline, around the face and scalp. Place a similar amount into the palm of your hand and massage into your body. Rinse thoroughly to remove all residue.